As the Creative Lead at Exeter City Futures I’ve been fortunate enough to find myself developing the Exeter 2025 Minecraft Challenge – a project that is using Minecraft as a tool to engage young people, and anyone who is interested, in creating a vision of a more sustainable city. Exeter City Futures is an independent Community Interest Company that is working to help the city of Exeter, in the South West of the UK, solve its urbanisation challenges in a way that reduces social inequality and contributes to economic growth. Its vision is to help Exeter live better by bringing together local government, private sector and communities to jointly solve the big transport and energy challenges faced by Exeter and shared by many cities around the world. Exeter City – engaging community. I began exploring the potential of Minecraft as a way to engage young people in our innovation process after our founder discovered the Ordnance Survey Minecraft map of Great Britain, generated from open data. I was asked to see if a map of Exeter could be generated in a similar way. It was a simple brief but once I started exploring how it could be done, it didn’t take long to realise the how a Minecraft map of Exeter could be an accessible and fun way of creating a collaborative vision of the city’s future. Research to see if there were existing projects to draw inspiration from revealed that globally Minecraft was already being used as a tool to support urban planning. There are already great examples of Minecraft being used to improve urban environments as part of the UN’s Block by Block programme in places like East Jerusalem. 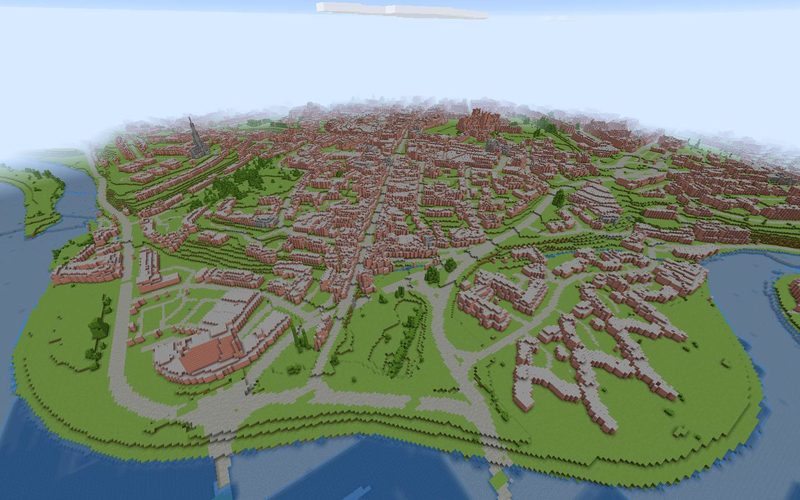 UK-based projects (such as Minecraft Ventnor, created using Geocraft, and Plymouth Cubed) showed that the game was already being used as a tool to recreate and redesign cities, and that there were already tools out there for generating maps from open data. The beauty of these maps is that they’re accurate, using open data from sources, such as Ordnance Survey, OpenStreetMap, and LIDAR, and accessible. They open up the possibility of engaging anyone who has a copy of the game, from pupils to town planners, in rebuilding and redesigning cities. 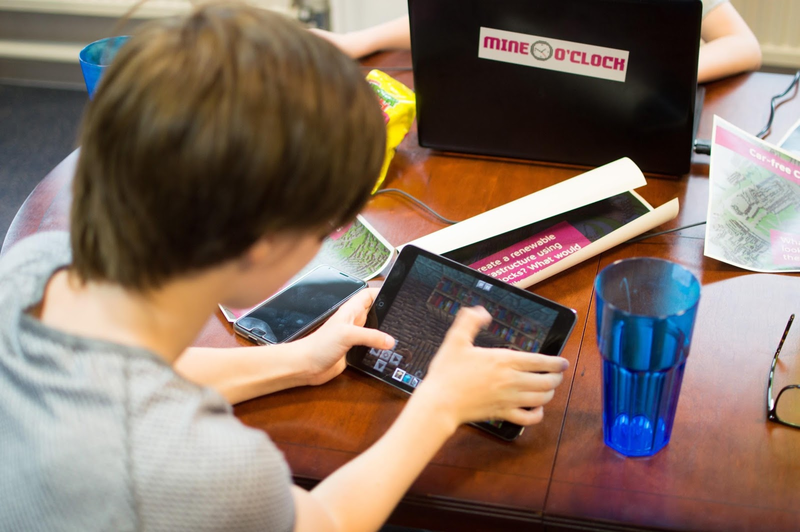 Using Geocraft to create a Minecraft map of Exeter, and reaching out to its creator Christopher Gutteridge, proved to be a turning point for the project. The support offered by Christopher was key to understanding Geocraft’s potential and developing an engaging map of Exeter. Exeter’s Royal Albert Memorial Museum and Art Gallery (RAMM) was another key source of inspiration for developing the project. Working with professional Minecrafters RAMM has been creating a series of historic maps of Exeter to allow players to experience as it would have been in Roman and Tudor times, Minecraft-style. The series of maps are not only immersive but they give the player a real sense of what it was like to be in the city in a different time – something that the Exeter 2025 Minecraft Challenge aims to achieve. The maps provided the perfect reference point in terms of scale and how recognisable it is possible to make a city in Minecraft. From the perspective of Exeter City Futures, and the urbanisation challenges it is trying to solve around transportation and the associated infrastructure, it is fascinating to navigate around the Roman city using a network of ancient roads that are still recognisable today. I also looked at historic examples of how the city’s planners engaged the public in the past, including the plans to rebuild the city following the Second World War. 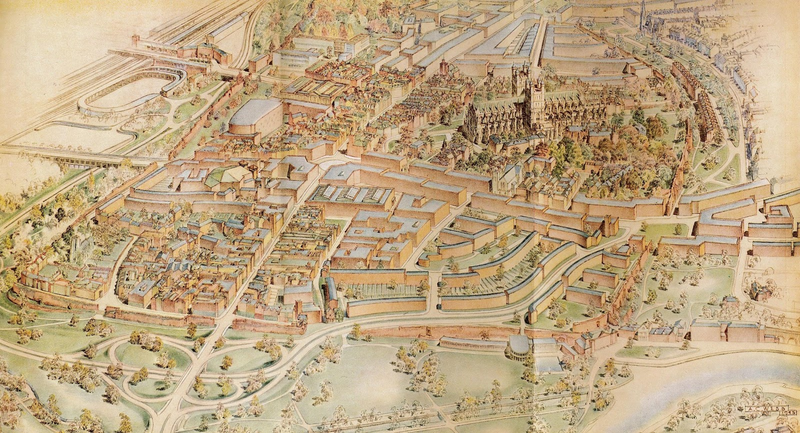 The plans for the project, published in book form in the 1940s, offered illustrations of how people of the past thought a future city could look, and highlighted sustainability challenges which are still present today such as congestion and a lack of green space. Where the town planners of the 1940s only had illustrations and wooden models to engage the public, we now have accessible video games that anyone can get involved with and have a hand in creating a model of the city they want to see. This post-war predecessor was not only an interesting glimpse at what could have been, but it also gave me confidence that Minecraft was the perfect tool for engaging citizens in a similar project with a focus on sustainability. Where the town planners of the 1940s only had illustrations and wooden models to engage the public, we now have accessible video games that anyone can get involved with and have a hand in creating a model of the city they want to see. The result of my research was the Exeter 2025 Minecraft Challenge – a campaign which uses a Minecraft map of Exeter in 2018, generated from open data, as a starting point for people to craft their vision of Exeter in the future. 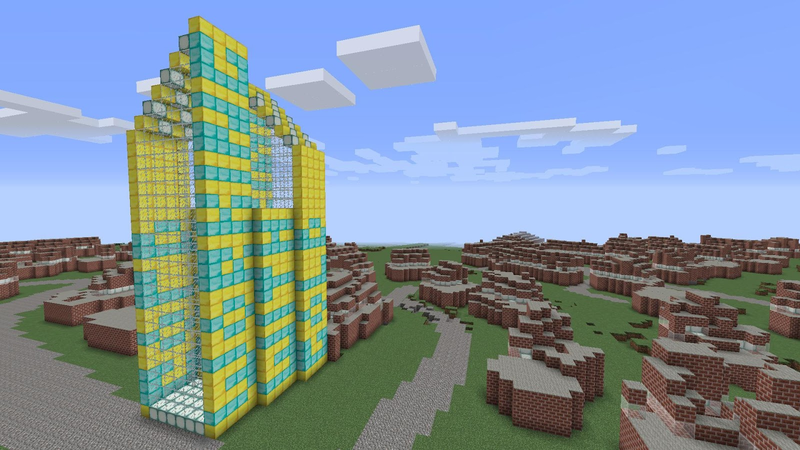 It features a series of challenge areas to inspire creative thinking about the problems the city faces and offers the Minecraft map for people to test out solutions on. Exeter CityIt features a series of challenge areas to inspire creative thinking about the problems the city faces and offers the Minecraft map for people to test out solutions on. There are five challenge areas Exeter City Futures has identified for people to respond to as part of the Exeter 2025 Minecraft Challenge; Car-free City Centre, Sustainable High Street, Alternative Transportation, Alternative Energy Sources, and Super Cycle Paths. Each area has been chosen to inspire clear thinking about the potential solutions to urbanisation challenges that could be crafted. To assess interest in the project following the initial research phase, a meetup was held, which attracted a small but engaged crowd, and since then interest in the project and attendance have grown. The meetups are a chance for Minecrafters to show off what they’ve been making with the Minecraft map of Exeter, and to engage attendees with developing responses to our challenge areas. The best responses to our five challenge areas will be showcased early in 2019, and we’re aiming to incorporate them into one final version of the map. Before the project had even officially been launched, a local Exeter artist Clare Bryden expressed an interest of using a Geocraft map of her area of the city to develop her own Minecraft my Home project. Exeter City Futures has supported her by generating the map which is being used to engage Clare’s local community with redesigning where they live. Some of the ideas that emerged were a network of waterways instead of roads, a tunnel under the city that could capture air pollution and funnel it into space, and a rail-based mail delivery system. Our most recent meetup in July resulted in many great ideas being shared for potential builds, and in some cases ideas were crafted at the meetup. Some of the ideas that emerged were a network of waterways instead of roads, a tunnel under the city that could capture air pollution and funnel it into space, and a rail-based mail delivery system. The ideas may be far-fetched, but participants are encouraged to let their imaginations run wild in hopes of identifying original solutions to urbanisation challenges. One attendee built a tranquil thinking space in a public area that is normally used to park vehicles, a great example of the kind of thinking that fits in perfectly with the vision of Exeter City Futures to create a car-free city. During Exeter City meetups participants are encouraged to let their imaginations run wild in hopes of identifying original solutions to urbanisation challenges. Over the coming months we hope to see more great ideas shared and crafted. The project has been planned so that it can evolve naturally and adapt to how people want to craft. Initially the map was only made available for the Java Edition of the game, but after most people turned up to our second meetup with mobile devices, I quickly converted the map and made it available on both platforms. By continuing in this way, it is hoped we can generate as many ideas as possible. To get involved in the challenge, visit exetercityfutures.com/minecraft. Although it is focused on engaging citizens in Exeter, anyone with an idea to make cities more sustainable is encouraged to get involved and submit their potential solutions to our challenge areas. For more games about urban planning and SDGs visit our Blog and Gamepedia! Mark Jones is the Creative Lead for Exeter City Futures, an independent Community Interest Company that is working to help the city of Exeter, in the South West of the UK, solve its urbanisation challenges. 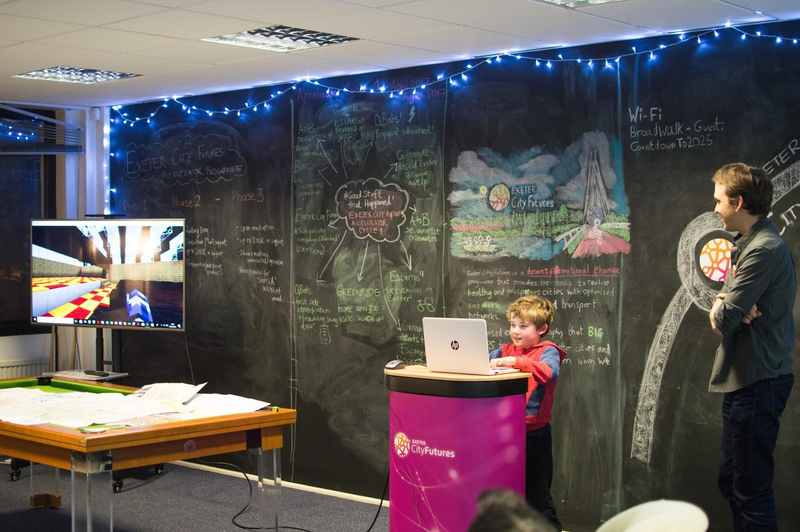 He is responsible for developing the Exeter City Futures website, designing their marketing materials, and leading on the Exeter 2025 Minecraft Challenge project. 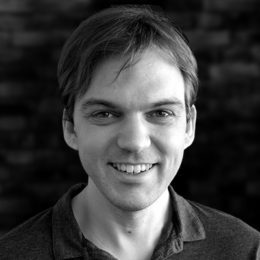 Before joining the Exeter City Futures team Mark honed his skills working as a freelancer for early-stage startups, and volunteering at Exeter’s Royal Albert Memorial Museum.